Offering stunning nature, not to mention a wealth of astronomical, gastronomical and cultural experiences, a visit to Uluru in a rental car is a must. There are plenty of things you can enjoy along the way to Uluru, also known as Ayers Rock. There's the thrill and excitement of exploring the legendary Stuart Highway if you are driving from Melbourne or Sydney - and then there's must-see places such as the Stuarts Well and the breathtaking landscapes if you are coming from Alice Springs to Uluru. VroomVroomVroom can help you find and pick up your car hire in Alice Springs, or even better a top campervan rental from Alice Springs to start exploring. We also compiled a quick list of some of the popular Uluru routes that you can take. Read below for details. Travelling from Alice Springs to Uluru is a route that everyone should have on their bucket list. Alice Springs, or Alice as the locals call it, is almost smack-bang in the middle of Australia - in the region known as the Red Centre. 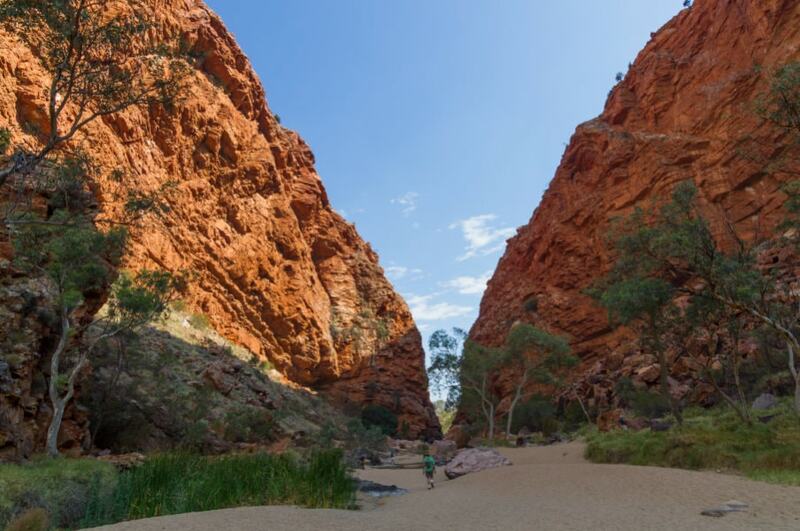 There is plenty to see and do here, from visiting the town's many museums to exploring the MacDonnell Ranges. See the Watarrka National Park and the spectacular Kings Canyon and then a further 300 km or so is where you'll witness the most iconic symbol of the Australian Outback: Uluru. Around 60 km south of Alice Springs is the popular roadside stop - the Mt Polhill, where you can camp for free for up to 24hrs. There's some a shade shelter, picnic tables, a toilet, a watertank and some good sunrise views of the Waterhouse Range. Most tourists also visit Kata Tjuta, fondly known as the Olgas, after Uluru. Treated sacred by the Aboriginals, Kata Tjuta is around 480kms southwest of Alice Springs and 35kms from southwest of Yulara and west of Uluru. The highway that links Darwin to Alice Springs is the Stuart Highway. After Darwin, the next notable town is Katherine, which is the gateway to the Katherine Gorge and many heart-pumping adventure sports. And if that's not enough, you may want to relieve your aching muscles in the thermal pools of Elsey National Park. Another worth-seeing is the legendary Karlu Karlu Devils Marbles. 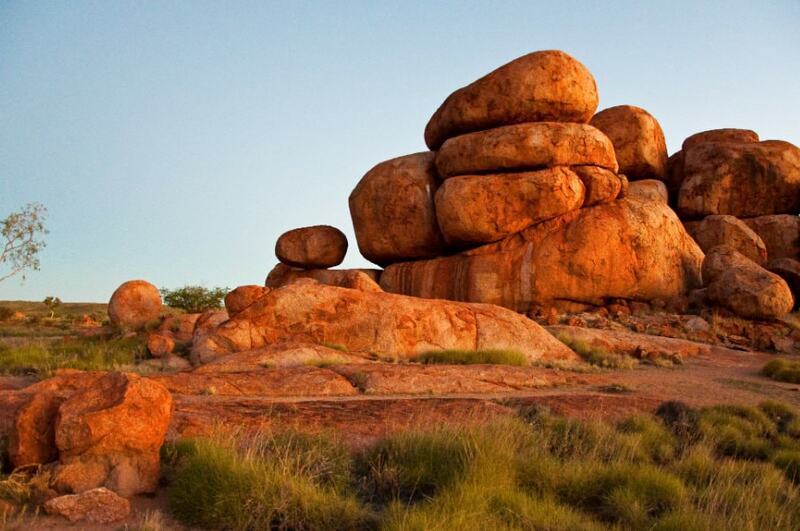 The Devils Marbles are a collection of massive granite boulders strewn across a valley south of Tennant Creek. An overnight camp is recommended if you want to see the renowned scene of the marbles glowing red and changing colour in the early morning light and setting sun. Don't forget to bring your camera to catchthe drama of this awe-inspiring ancient landscape. The trip from Adelaide to Uluru is definitely worthwhile. 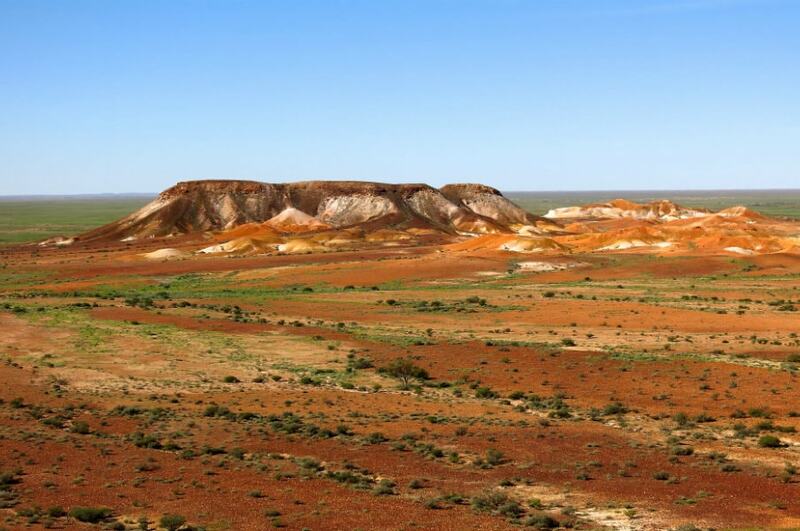 You can make a stop in Port Augusta (only three hours from Adelaide) and Coober Pedy (9 hours from Adelaide) known as "the opal capital of the world". Take note that you can do and explore it in one go by just stopping at Coober Pedy, which is already an experience with its underground structures - from the churches, opal mining museums, hotels and a whole lot more. Explore Wadlata's Tunnel of Time by walking into the jaws of the big ripper lizard and get transported into prehistoric world of life before man on Gondwanaland. Another worth-stopping by is the Matthew Flinders Lookout because its amazing vista of Spencer Gulf against the spectacular backdrop of the Flinders Ranges. Cited as one of the most prolific Opal mining centres in Australia, now is the best time to go opal fossicking in Coober Pedy. Other must-see local attractions in Coober Pedy are the Big Winch Lookout, the Boot Hill, Centenary Mosaic Garden, Crocodile Harry, Kanku Breakaways and Dog Fence. Getting to Uluru is an easy drive despite the long distance. If you are renting a car, you can travel entirely on sealed roads and you will not even need a 4WD. If it's your first time driving in Australia, make sure you really understand where you can and cannot drive the vehicle as most car hire companies may have restrictions. Take for instance, the use of vehicles from Budget Australia in certain areas in Northern Territory is restricted to commercial 4WD vehicles only, hence it is recommended to contact and consult your rental location for more information. In addition, since Uluru is a long way from everywhere, don't be surprised if the fuel price on outback highways can take up to 50 cents per litre - which is way more expensive than it is in other capital cities of Australia.